Tacoma and Pierce County combined have more than 70 community gardens. Tacoma has the goal of having more gardens per capita than any other city in Washington State. Discover all of the sustainable agriculture including community gardens and farmers markets using the interactive Tacoma Green Living Guide. 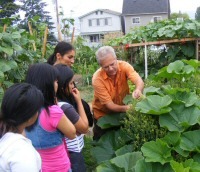 There are numerous community gardens throughout Tacoma, including several on City property. The City of Tacoma is a partner of the Tacoma-Pierce County Community Gardens Program under the umbrella of the Pierce Conservation District. Community Supported Agriculture (known as CSAs) allows you to buy a “share” from a local farm. In return, you receive a box of farm-fresh produce every week during the growing season. The farm benefits from your financial and community support. You benefit by receiving the best local produce and getting to know your farmer. Find a directory of Puget Sound area CSAs here. The Central Co-op is a member-owned organization for people interested in food that is: natural, local, fresh, organic, humanely raised, non-GMO, sustainable, and affordable. Central Co-op had a location in Tacoma but closed on July 18, 2016. In May 2017, the Co-op announced they signed a new lease for a store at Pearl and 46th Street and will be reopening. For more information on the new location, visit the Tacoma Co-Op's website. Responsibly raising backyard chickens has significant environmental, health, and other cost savings for individual owners as well as the greater community. Chickens provide valuable food that is local, organic, and inexpensive. Chickens are also mini-backyard composters, eating most leftover kitchen scraps. The Tacoma Municipal Code on Poultry and Pigeons was updated in 2012. Be aware of the rules and make friends with your neighbors. If you're interested in more than the standard allowable number, you'll need written consent (suggested template) from neighboring owners. Check with your local jurisdiction and request a copy of the legislation that describes quantity, setback requirements, and lot sizes. Every jurisdiction has different rules.